Stocking stuffers aren't what they used to be. A stocking stuffer or filler used to be trinkets or treats and likely some essential items like socks and underwear. Somewhere over the years stocking stuffers have become full-blown gifts that barely fit in the stocking. I'm saying, cut it out, people. Let's bring the stocking stuffers back to their roots. My favourite things to receive in my stocking are beauty items. Pretty nail polishes, fancy creams and make up. This year, I'm adding masks to the list. Facial masks have taken the beauty world (and YouTube) by storm the last few years. From painted masks, to peels, to cleansing masks, people all over the world are using masks for all sorts of purposed. I quite enjoy them too. I don't LOVE sitting with a mask on for half an hour -- kind of like teeth whitening strips -- but my skin feels so radiant and smooth when I take the mask off, it's totally worth it. For Beloved Girl (a subsidiary of For Beloved One) makes a collection of affordable Mineral Cloud Silk Masks for beauty junkies on a budget. There are six masks in the series, each one using different minerals to target various skin types and concerns. Choose from Skin Renewal, Extreme Moisture, Flawless Brightening, Puffy Elimination, Oil Control and Active Resilience. Each mask comes in boxes of 3 for $12.99 CAN. The masks are fairly easy to apply and the the silky fabric is beautifully pliable and soft. There's a plastic layer you need to remove, which can be cumbersome, but with some adjusting and fixing, you get the mask into place. I really like the Fe -- Flawless Brightening. While on, it is cool and comfortable and when you remove it (don't rinse the goodness! ), your skin is almost instantly illuminated. I didn't even want to wear make-up afterward, although you're supposed to apply a day cream. If face masks aren't your thing, what about a hair mask? Yes, I said hair mask, and no it's not conditioner. And yes, even if you condition, a hair mask is a good idea. The Moroccanoil Smoothing Mask smooths and tames unruly and frizzy hair. Here's the thing: you need to shower, wash and towel dry your hair. Then you apply the mask, comb it through, wait 5-10 minutes before rinsing. It's not something you do every time you shower, cause, who has time for that, but the results are phenomenal and the scent of the mask is just divine. Like beachy coconuts. Heavenly. $44.00 CAD. 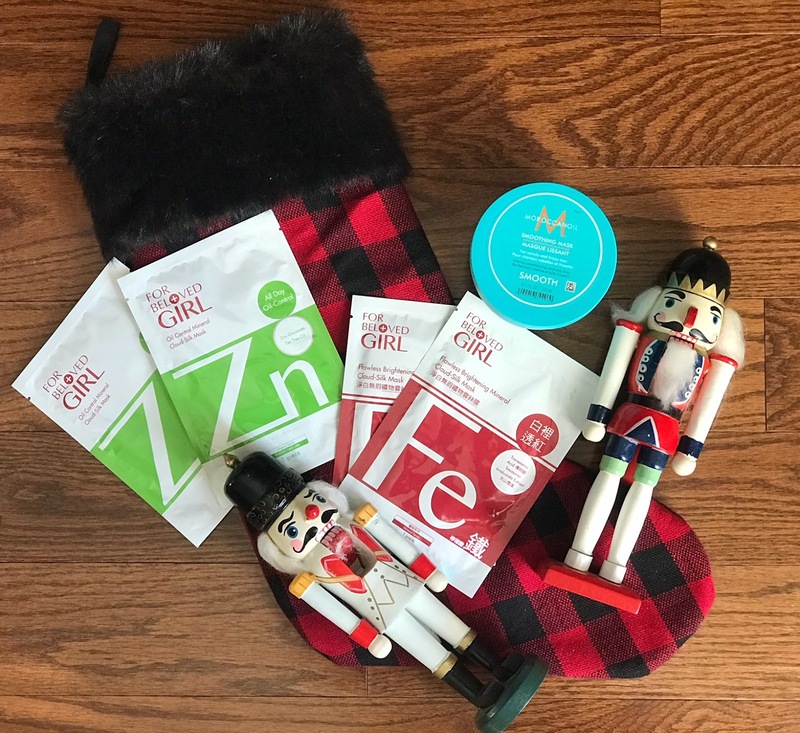 These little luxuries are perfect stocking stuffers: they're definite treats, they're affordable, and they're definitely small enough to fit into a stocking! Most of all, they would make the receiver very, very happy. Simply Suppa has 2 boxes of For Beloved Girl Face Masks to giveaway -- Tea Tree Oil Control Mineral Mask and Flawless Brightening Mineral Mask. Perfect to share, or keep for yourself! To enter to win, visit Simply Suppa's Instagram page and look for the post!